Below is the latest data from Credit Suisse on the eurozone money stock - M3, the broadest indicator. 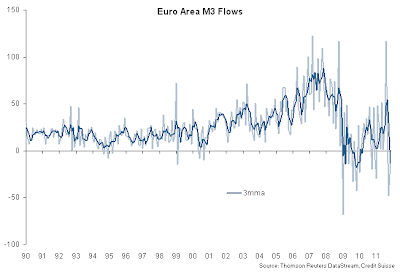 This is troubling because if Germany's M3 continued to expand, the periphery economies credit conditions deteriorated even faster than the euro area as a whole. Credit Suisse: That weakness on the money side was reflected in a deterioration in the credit counterparts. Bank lending fell 0.1% on the month. That was largely driven by a drop in loans to firms. Banks also continued to delever outside the euro area. Their net external assets fell EUR25bn in November after a EUR60bn drop in October.